Summary: If Naomi had picked tails, she would have won the coin toss. She wouldn’t have had to go back for the yearbook camera, and she wouldn’t have hit her head on the steps. She wouldn’t have woken up in an ambulance with amnesia. She certainly would have remembered her boyfriend, Ace. She might even have remembered why she fell in love with him in the first place. She would understand why her best friend, Will, keeps calling her “Chief.” She’d know about her mom’s new family. She’d know about her dad’s fiancée. She never would have met James, the boy with the questionable past and the even fuzzier future, who tells her he once wanted to kiss her. She wouldn’t have wanted to kiss him back. 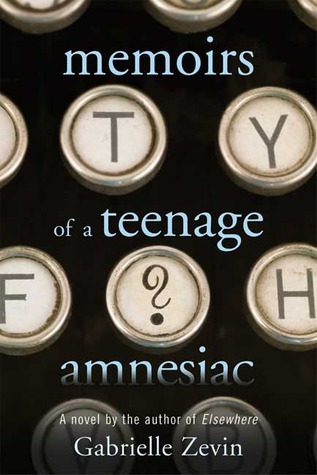 Memoirs of a Teenage Amnesiac is a 2008 Bank Street – Best Children’s Book of the Year [x]. Review: The story is about Naomi who loses 4 years of her life due to amnesia. It would be interesting to see how a teenager or anyone in general would go through that. This was the main reason why I picked up this book. As I dived into the book however I found that Naomi was very snotty and was using her amnesia as an excuse for everything. I know the ordeal is stressful but she seemed highly selfish and didn’t care about anything but herself. All 3 love interests annoyed the crap out of me. Especially Will. Yearbook this. Yearbook that. There was also no closure. The book just kind of ended. When I closed the book I felt like I wasted a lot of time. I really liked Gabrielle Zevin’s book Elsewhere and was really excited to give this one a go. I however was disappointed. This entry was posted in book, book review, books, review, reviews. Bookmark the permalink.